New Melbourne Browncoats, Inc. | Enter the CSTS Melbourne Cosplay Contest and Win a $50 Costumes.com.au Gift Voucher! One week until Can’t Stop the Serenity! Help us sell out and win prizes! We’ve got prizes galore for Can’t Stop the Serenity on Saturday! 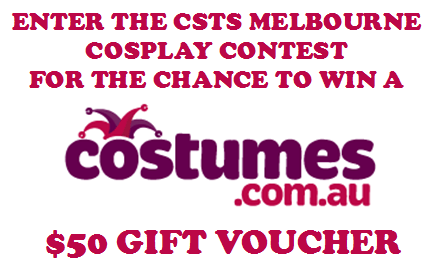 Enter the CSTS Melbourne Cosplay Contest and Win a $50 Costumes.com.au Gift Voucher! All you need to do is to buy a ticket to Can’t Stop the Serenity Melbourne and come along on August 2 in a Whedonverse themed costume! Tickets are just $20 and are available online now at bit.ly/csts2014. Check out last year’s entries for inspiration!